The Vanuatu delegates to the Melanesian Festival of Arts and Culture presented a significant gift to the Governor General of Papua New Guinea. The gift presented by the Vanuatu National Cultural Commission director Mr. Mariselin Ambong to Sir Michael Ogio was made of a special carving and it represented or carried a sign of the voice of the high chief, and also the voice calling for corporation and unity. The special carving in Vanuatu’s common dialect is known as ‘Tam Tam’ of the ‘Mege’ (home of the carving) which signifies the voice of a chief or ‘bigman’. Sir Ogio said in response to the gift that on behalf of the 7million plus people of PNG and the PNG government I am happy to accept the gift, not to me only but to the people of PNG. Mr Ambong and the Vanuatu team were happy and thankful to the 7million plus people of Papua New Guinea and PNG government for the welcome. Ambong said in an interview with post courier that the Governments of Melanesia must focus its priorities to its people, and make such festivals for us to work together and address Melanesian issues. “We gladly appreciate the support of PNG Government. We expected support from our government but got negative response,” said Ambong. He further added that the MOA in 2012 Melanesian Spearhead Group meeting had an agreement to support Melanesian countries and PNG has shown that to us Vanuatu delegates to travel here for MFAC. The Vanuatu delegates assured the 7million plus people of PNG and its Government that if we host the next MFAC in Vanuatu we will look after them properly. 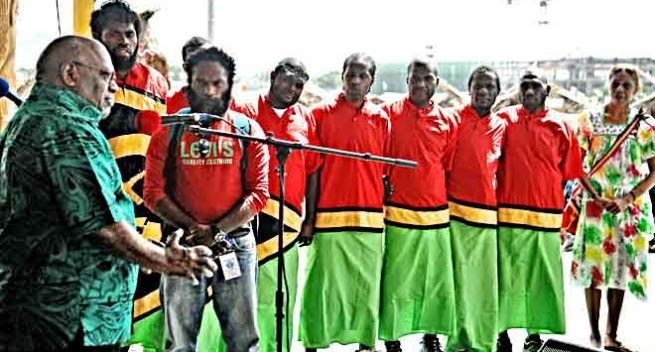 The Vanuatu team thanked the PNG government and the department of culture and tourism for a wonderful framework structure underlying within the Melanesian Festival of Arts and Culture.